Ectropion and entropion are two types of eyelid problems that can cause discomfort and irritation of the eyes. They both generally require surgical repair to avoid eye health issues and potential vision loss. Ectropion is a “turning out” of the eyelid. Typically occurring on the lower eyelid, the skin of the inner lid is exposed, either in one section of eye or across the entire lid. This prevents tears from draining from the eye correctly, resulting in irritation. 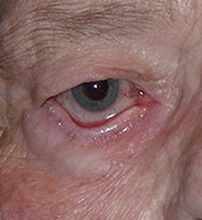 Common causes of ectropion include age-related weakening of the connective tissue around the eye, sun damage, tumors, burns and the removal of too much skin during blepharoplasty. In some cases, ectropion occurs as a congenital birth defect or as a result of facial palsy. The major symptoms of ectropion are usually very dry eyes, pain, excessive tearing and redness both on the eye and the eyelid. This may be accompanied by or contribute to the formation of ailments such as conjunctivitis and interstitial keratitis. Over time, if the condition is not treated, the cornea may become damaged due to abrasions, ulcers or infections, resulting in some loss of vision. Contact your physician right away if you are experiencing light sensitivity, a decrease in vision or rapid onset of redness in the eye. Your doctor will be able to diagnose ectropion upon an examination of the eyes. Artificial tears can help provide temporary relief from dryness. But for full correction of ectropion, a quick surgical procedure in which the lid is tightened is usually necessary. The area is numbed with a local anesthetic and sometimes light sedation is provided as well. For ectropion due to muscle weakness, the surgery may involve the removal of a small section of eyelid to tighten the muscles in the area. When the ectropion is caused by scars or prior surgery, the procedure typically relies on a skin graft to allow a repositioning of the eyelid. Most patients require use of ointments on the eye for a few week. The symptoms typically disappear immediately, but you may experience some short-term bruising or swelling as a result of the procedure. Entropion is a “turning in” of the eyelid. Typically occurring on the lower eyelid, the skin and lashes rub painfully against the cornea. The condition may cause the lid to turn in constantly or only at times when the eyes are closed tightly. 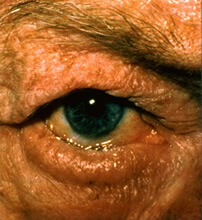 Entropion usually arises as a result of aging since the muscles around the eyes may progressively weaken. A spasm or relaxation of the muscles near the eye can cause the lid to turn inward. Other causes can include injury, congenital defect, skin infections and various inflammatory conditions. You may also be at higher risk for entropion if you have undergone facial surgery or have facial scarring that affects the natural curve of the eyelid. The initial symptoms of entropion are often pain in the eye, excessive tearing, redness and irritation. There also may be dryness of the eyes that causes discomfort. Over time, if the condition is not treated, the cornea may become damaged due to abrasions, ulcers or infections, resulting in some loss of vision. Contact your physician right away if you are experiencing light sensitivity, a decrease in vision or rapid onset of redness in the eye. Your doctor will be able to diagnose entropion upon an examination of the eyes. Lubricating eye drops may be used to lessen certain symptoms such as dry eyes. Temporary relief can also sometimes be found by using Botox, skin tape to hold the eyelid in place or strategically placed stitches. But ultimately, entropion generally needs to be corrected through a brief surgical procedure in which the eyelids are repositioned. The area is numbed with a local anesthetic and sometimes light sedation is provided as well. For entropion due to muscle weakness, the surgery may involve the removal of a small section of eyelid to tighten the muscles in the area. When the entropion is caused by scars or prior surgery, the procedure typically relies on a skin graft to allow a repositioning of the eyelid. Most patients require use of an ointments on the eye for a few weeks. The symptoms typically disappear immediately, but you may experience some short-term bruising or swelling as a result of the procedure. We provide a full range of services to meet all eye care needs, from the routine to the cosmetic to the surgical. Whether you need a routine eye exam for eyeglasses or contact lenses, a medical eye exam for diabetes or other health-related issues and medications, cataract or oculoplastic surgery, eyelash enhancement with Latisse, or Botox injections, you will find excellence here. Copyright 2017 Catalina Eye Care. Tucson Web Design by Anchor Wave Internet Solutions.